Sin Tax – Mother Earth Brew Co.
A sucker for peanut butter anything, my interest was piqued when I discovered Sin Tax from Mother Earth Brew Co. Whereas other peanut butter stouts use a sweet Milk Stout to support the peanut butter flavor, Mother Earth’s Sin Tax is able to balance the rich peanut butter in a full on imperial stout. The pour and color are spot on for the style, boasting a fluffy cap of coffee colored foam that leaves subtle lace throughout the glass. The nose is of roasted malt, subtle chocolate, and a polite dose of peanut butter. “You know that feeling when something is so good, it has to be bad? Much like the sumptuary tax placed on the beverages we love so much, at times we feel we must limit ourselves in the wants and needs of our strongest desires. 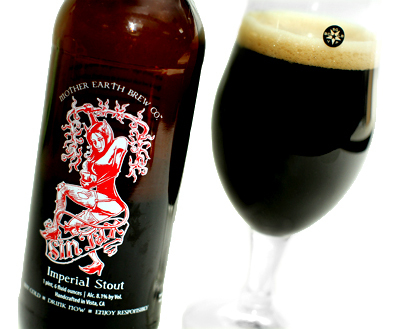 Desires like that of the full bodied and robust flavor of an imperial stout both dark and rich, paired with the creamy essence of peanut butter, twisting and tangling over your taste-buds until you truly comprehend that it just may be too heavenly NOT to be a sin.” – Mother Earth Brew Co. Taste follows suit with a well balanced stout that rides out on a peanut butter back end with a slightly dry finish that on the colder side emulates dark fruit mixed with hop bitterness, but matures to a silky smoothness on the warm side that lands more in the chocolate and peanut butter tones. At 8.1% the mouthfeel is right where you’d anticipate and isn’t weighed down by the character of the peanut butter. Hop character and carbonation are slightly elevated for the style, but overall the brew is well balanced, especially in regards to its treatment of the peanut butter. Brewery Mother Earth Brew Co.